In the wedding world a First Look is a moment prior to the ceremony when the couple gets a chance to see each other for the first time. The couple will usually spend the first part of the day getting ready separately and the First Look is their first chance to see each other in their wedding attire. First Looks are often staged and choreographed in a way so the photographer and videographer can capture the expressions on the bride/groom’s faces and is often set up in a beautiful setting for maximum impact of scenery. What was once seen as a trend is now becoming practically commonplace, but there are some couples who shy away from it. To lay it all out here are the pros and cons to doing a First Look. Having a genuine moment together and having the chance to hug, kiss and talk. Want to keep things traditional and wait until you walk down the aisle to first see each other? Sure that is fine, but once you get to the altar and are in front of each other you can’t give your partner a hug, or a kiss, or talk to them at all. But with a First Look you can laugh and touch and have a genuine interaction, and do all of this without all of your guests watching you. Getting more photos in more locations. A big benefit of a First Look is that it allows for lots more time to take your formal photos. Without one you just have the time during cocktail hour to get all the photos of your bridal party, families, and shots of the two of you which is a process that always feels rushed and doesn’t give you the ability to move around to different backdrops. But if you choose to do a First Look a few hours before your ceremony you can drive to a park or to cool architectural spot for a few shots, then to a pretty walkway for some more, and get all of your formal photos taken in fun locations and in a way that feels relaxed and enjoyable. Being able to go to your cocktail hour. This ties in to the one above, and it’s a big one for some couples. When you plan your wedding you choose all of these cool details and for some couples it is a big deal for them to be able to be at cocktail hour so they can taste all the fun hors d’oeuvres and get to spend time with all of their guests. Without a First Look couples rarely get a single second at their own cocktail hour. Outdoor photos, especially for winter or evening weddings. This is one that some couples don’t think about, but if you are getting married in the winter or you are planning for a late evening wedding you will have to deal with the problem of running out of daylight. After the sun sets there is no natural light for outdoor photos, and natural light is always the best light for beautiful photos. But if you have a First Look you open yourself up to the ability of being outdoors for your formal photos. Trust me, your photographer will thank you on this. Calming your nerves. Your partner is your best friend and the person you like to spend time with the most. 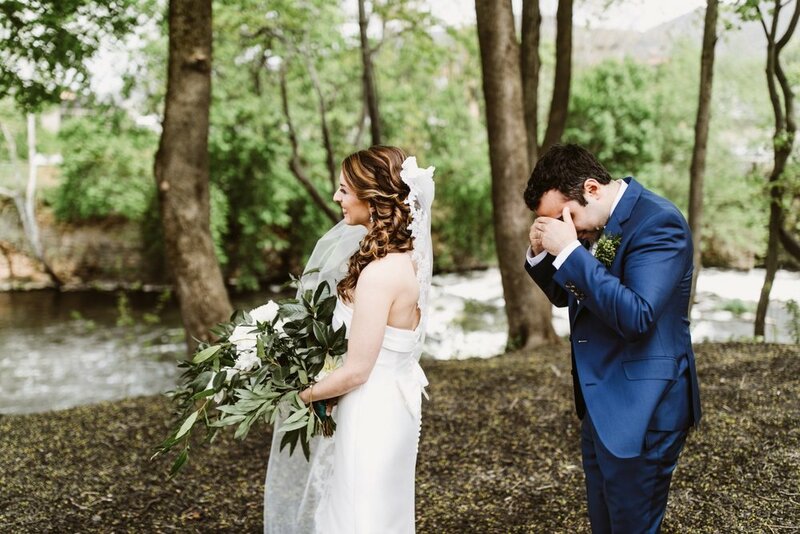 Doing a First Look allows you the chance to get to that person earlier in the day and actually get to spend some sweet moments with them before your ceremony. I have seen time and time again that an anxious bride or a nervous groom becomes totally at ease as soon as they get to be with the one they will be marrying. Who wouldn’t want to feel a sense of calm and peace before their wedding ceremony begins? Not having the “first look” be the moment he/she walks down the aisle. This is most common reason couples give for not wanting to do a First Look, and trust me I get it! There is magic in the air the moment the bride/groom walks down the aisle and it’s such a special time when couples lock eyes for the first time. But (… and I am not making a good argument for this being a con, I know…) even with a First Look you will still get butterflies walking down the aisle and your heart will still skip a beat when you see the partner you are able to marry. That moment is not taken away because you already saw each other earlier, it is usually just a less anxious experience because you were able to rid yourself of your nerves and can be more grounded and present now as you go through your wedding ceremony. Did you know that you can have a First Look with someone other than your partner? We see a lot of brides who choose to do a First Look with their dads which is always so sweet! 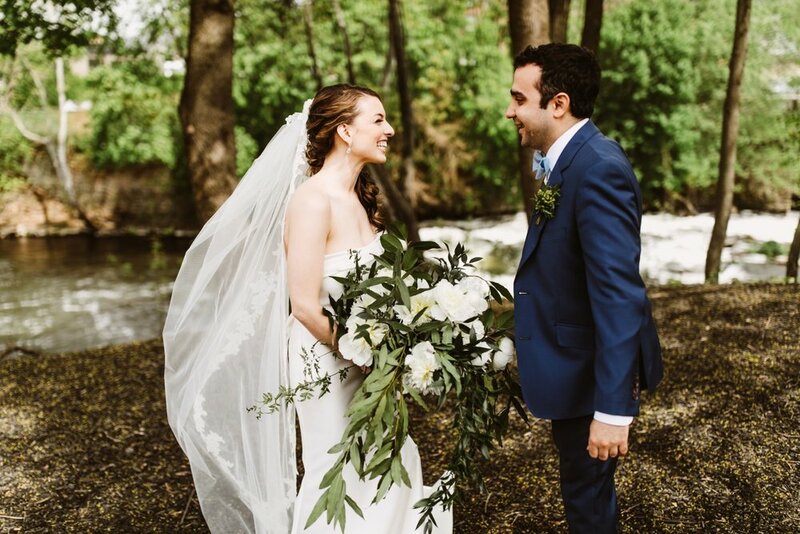 I know this post seems very pro First Looks but please know that I respect all of the decisions my couples make and I work hard to plan the most authentic wedding day for them. Bottom line for any choice you make for your wedding is this: Be true to yourself and be in agreement with your partner. This path through wedding planning will extend into a lifetime of marriage so it’s not bad to start practicing these values and principles now.